The opportunity to discover our famous Bigouden! in a very welcoming cottage! Our 3 holiday homes "Ô ty kaer, cape west"
Our 2 other holiday homes on Penmarch # 633357 and 870621 on this site. Holiday house for rent all year! Located at the tip of Penmarch with its large beaches fishing ports, its rocks .Our fisherman's house designed for your holidays located 600m from a large sandy beach, shops 200m, small fishing port 800m, the nice fisherman's house 'O TY KAER' will delight you with its irresistible charm ..
On the ground floor is a warm and friendly environment that you will find a cozy and bright living room (+ stove) in which you can relax there, a kitchen, a dining room cellar toilet. make your vacation more enjoyable! Then the ride continues with the discovery of beautiful rocks or winter you can experience a storm, breaking waves come here overwritten. To discover the Penmarchaise coast, the beautiful beach of Pors carn fine sand that ends with the tip of the torch, a paradise for surfers. We provide you with the necessary equipment for the baby home !!! The summer months offer numerous cultural, folkloric and festive activities, including the port of Saint Guénolé and Kérity. Penmarc'h is lined with 12 kms of coastline, including 8 of fine sand. landing of fishing boats, many restaurants and pancake very invigorating sea air in all seasons, micro-climate and strong sunlight. Run there between March and April. On palud, entire fields of tulips are grown. It is like in Holland! Many prehistoric remains (menhirs, dolmens) or historical (churches, chapels, mansions) are open to the curiosity of the visitor. in the heart of Bigouden the tip of the torch is an impressive natural peninsula. Windswept, it is a known spot for surfers and backpackers who come to explore its megalithic sites. come there in the spring, the tip is covered with colorful tulips. The tip of the torch 3 km or Beg an DORCHENN in Breton, means "the tip of the hill. ' Jutting out into the sea, La Torche is a rocky outcrop, a wild land which delimits the south Bay of Audierne. A site side of the world, abrupt but so beautiful. Run there between March and April. On palud, entire fields of tulips are grown. It is like in Holland! The bathroom is on the theme of the country shingle and wood. You have a bath but if you wish you can also take a shower! Novelty: House facing south west, very bright The house has just been equipped with a stove for an even more fun atmosphere! A TV flat screen satellite equipped with its (his new channels will delight all foreign tourists !!) For our little vacationers we provide a cot, high chair, deckchair and stroller (do not hesitate to ask at the reservation). Nespresso + classic coffee maker Large enclosed garden, private location for cars. Penmarch with its air iodized, is among the purest in Europe, in fact a nature destination par excellence Commune very rich in heritage! .The owner welcomes you on your arrival, and resides in the same town. 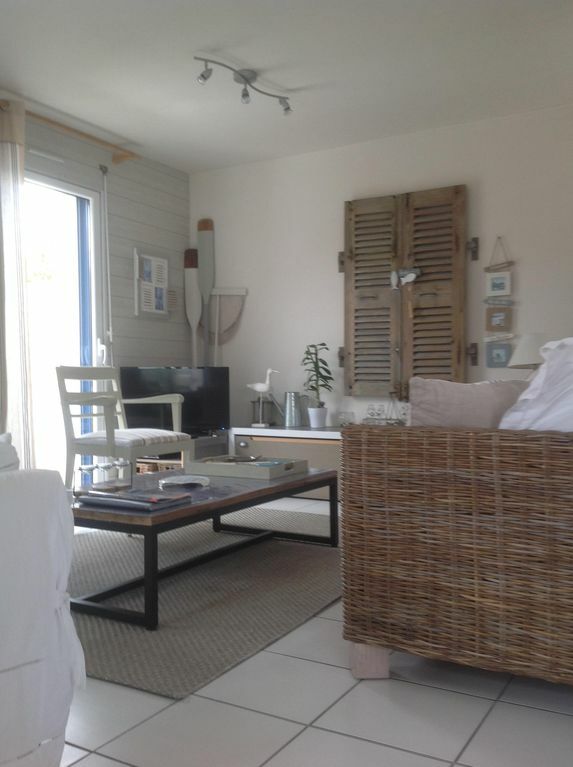 Belle maison, bien meublée, tout dont on a besoin, à bord de la mer. Nous avons été bien accueilli par Mireille. Les photos donnent un bel aperçu de la maison, et il nous manquait rien d'important. Trois belles chambres à coucher, salon, salle à manger et cuisine. Très propre. Nous le recommandons fortement. La propriétaire est très accueillante et arrangeante. Maison conforme à la description, rien ne manque. endroit très calme et reposant. Roxy vous remercie d'accepter nos amis les animaux. Wir wurden von der Vermieterin nach einer langen Anreise sehr nett begrüßt und haben eine tolle Führung durch das Haus bekommen, inklusive "Willkommens-Kuchen". Das Haus ist sehr liebevoll eingerichtet. Wir haben hier einen sehr schönen Urlaub bei bestem Wetter verbracht und kommen gern wieder. Der Kontakt zum Vermieter sowie die Organisation der Buchung war unkompliziert, freundlich und direkt möglich. Das Ferienhaus ist hell und schön eingerichtet und komfortabel. Auch die um das Haus herum angelegte Terrasse sowie der mit südlichen Pflanzen versehene Garten tragen zum entspannten Gefühl bei. Die Pflanzen bieten guten Sichtschutz, so dass wir uns privat und ungestört fühlen konnten. Das Haus liegt zentral, so dass verschiedene Strände mit dem Auto schnell und gut zu erreichen sind (10 min.). Auch Einkaufsmöglichkeiten sind vorhanden. Wir haben uns in diesem atmosphärisch sehr schönen Ferienhaus rundum wohl gefühlt und können es weiter empfehlen. Une maison spacieuse , confortable , pleine de charme et décorée avec goût ! Tout d'abord , nous avons beaucoup apprécié l 'accueil chaleureux de la propriétaire , madame Le Carre .Un grand merci également pour le far fait maison et la bouteille de cidre qui nous attendaient et auxquels nous avons fait honneur ! Une maison dans laquelle nous aurions bien aimé rester plus longtemps tant elle est agréable , pratique , propre et décorée avec goût . Nous avons même pu trouver une place pour l'enclos ( 1m15 x1m15 )de notre Fripouille (lapin nain )dans le hall d'entrée sans gêner le passage ! Le matin , nous sommes accueillis par ...le chant des oiseaux . Il est vrai que la venelle est essentiellement fréquentée par les vélos .Peu de voitures donc . De belle ballades à faire en partant de la location car les pistes cyclables sont nombreuses ( location de vélos au village , près du phare). Une location que nous recommandons vivement . The house is located in a common fishing PENMARCH translated 'Horse Head advanced in the ocean. South side of the main beach ster brings you to the small port of Kérity, continuing the seafront you will discover in the west of the lighthouse Eckmuhl 66. 48m high, 307 steps where you have a panoramic view of the country bigouden. You continurez your discovery by the chapel of joy built in tribute to sailors lost at sea, then comes the fishing port of St guénolé, langoustines landing fish. Then the beautiful rocks where you can discover the winter storm, breaking waves come s' are crushed. To finish the Penmarchaise side the beautiful beach of Pors carn velvet sand that ends with the tip of the torch, a paradise for surfers. A common image and rich heritage. To discover.